A) What is Battery Electrolyte? Battery Electrolyte is a liquid solution of water and sulfuric acid; typically about 35-40% sulfuric acid. It is a corrosive acid hazard that will burn skin and eyes as well as damage clothing. Refer to an SDS sheet before working around battery electrolyte. Always use appropriate personal safety wear. B) What do you mean by the statement “Neutralizing Acid Adsorber™ will neutralize and adsorb electrolyte”? 1) Upon contact with electrolyte, the electrolyte is neutralized. “Neutralized” means the sulfuric acid is converted to water and sodium salt. This happens very quickly. 2) The water is then adsorbed. Only a powder is left to clean-up. This is much easier to clean-up than a paste liquid. C) What is the shelf life of Neutralizing Acid Adsorber™? Products over five years old have been evaluated and found to be fully effective. We have been careful to package the product in quality plastic containers. This protects against contamination from the environment. Normal variations in moisture have not caused the product to “clump”. Shelf life characteristics are very good even with partially used containers – if the cap is put back on after use. Neutralizing Acid Adsorber™ will not “clump” like boxes of baking soda or bags of sodium bicarbonate. D) My battery room floor is contaminated with electrolyte in various places. Can I neutralize it with Neutra-Clean™? Neutra-Clean™ might be difficult to clean-up. Locally treat any puddles of electrolyte with Neutralizing Acid Adsorber™. Sweep floor to remove dirt and debris. Make a 10% solution of Neutralizing Conditioner™ and hot water (about 1/3 quart of Neutralizing Conditioner™ to 4 quarts of hot water). Wet mop floor a few times. Wet mop floor two or three times with hot water. E) How do I determine if I have applied enough Neutralizing Acid Adsorber™ to an electrolyte spill? In treating a spill with Neutralizing Acid Adsorber™, begin by forming a dike around the outer edge of the spill. This will limit the contaminated area. Continue applying the product working toward the center of the spill. When all the liquid is covered, sufficient product has been applied. If liquid puddles reappear, simply add more Neutralizing Acid Adsorber™ to those areas. Allow to sit for 3-5 minutes, then sweep up with clean-up equipment provided in your FIRST RESPONDER™ Acid Spill Kit. F) Where do I go for more information on cleaning up battery acid spills?Check out our full guide on how to clean up battery acid spills. 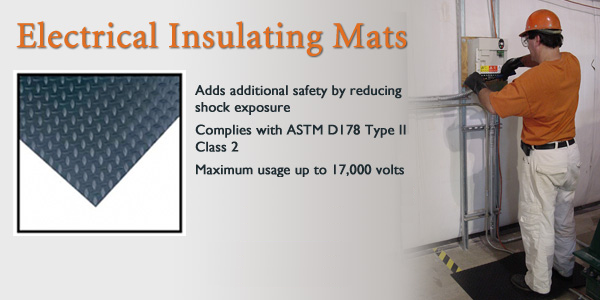 This acid absorbant mat with liquid tight backing is effective at preventing acid damage to floors at opportunity charging stations and battery stations — anywhere incidental electrolyte spills are randomly experienced. The 45″ width of the mat makes it ideal for use around motive power, industrial batteries or under VRLA battery racks. 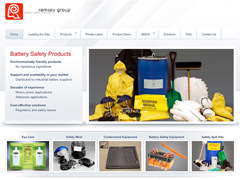 Ramsey Group, Inc. manufactures and distributes acid spill kits (safety spill kits), neutralizing and adsorbing industrial battery cleaners, and containment systems for forklift batteries and industrial batteries used in motive power applications and stationary applications. Facilities installing motive power stationary industrial batteries must comply with regulations requiring acid spill containment systems and emergency spill response. Our stationary battery containment systems contain any drips or leaks of hazardous material. Industrial battery cleaners neutralize and adsorb acid spills / electrolyte spills from lead acid and nickel cadmium (Ni Cd) batteries used in forklifts and in industrial and telecommunications settings. 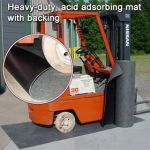 Maximize incidental acid spill containment with an acid absorbing mat. Ramsey Group, Inc. also manufactures and distributes safety wear kits to be worn by personnel treating an emergency spill of acid or electrolyte from lead acid or nickel cadmium (Ni Cd) batteries. Appropriate personal protection must be worn when applying industrial battery cleaners to an acid spill or electrolyte spill from a motive power stationary industrial battery installation. In 1989, Neutralizing Acid Adsorber™ was an innovative product used to neutralize and adsorb hazardous electrolyte spills. As government regulations evolved, First Responder™ Acid Spill Kits were introduced. These kits included personal safety wear and appropriate acid spill cleanup equipment to protect employees as they responded to hazardous material spills with industrial battery cleaners. All of these materials were packaged in a self contained kit to promote timely response to a spill emergency. In the mid nineties, closed loop battery wash systems were developed. These systems required a highly concentrated neutralizer to treat large quantities of acidic water. The technology behind Neutralizing Acid Adsorber™ was used to develop Neutralizing Conditioner™, a product which allows reuse of the wash water conserving precious resources and minimizing waste. During this same time period, Ramsey Group developed an effective battery housing neutralizer and cleaner, Neutra-Clean™. This product detects the presence of acid by changing color. By continuing to apply the product in the area of color change, the acid is neutralized and a second color change confirms the hazard is eliminated. Since 1989, Ramsey Group product development has progressed with one common trend: all products are user friendly and environmentally safe. No hazardous ingredients are acceptable! Although we are proud of our heritage and business associations, the real leaders were those customers who invested their dollars in Ramsey Group products to support our on-going efforts. We give our thanks and admiration to each of you. Please contact us with any questions you may have about industrial battery cleaners, stationary battery containment systems, responding to emergency electrolyte spills, or any other issues in maintaining your motive power stationary industrial batteries.